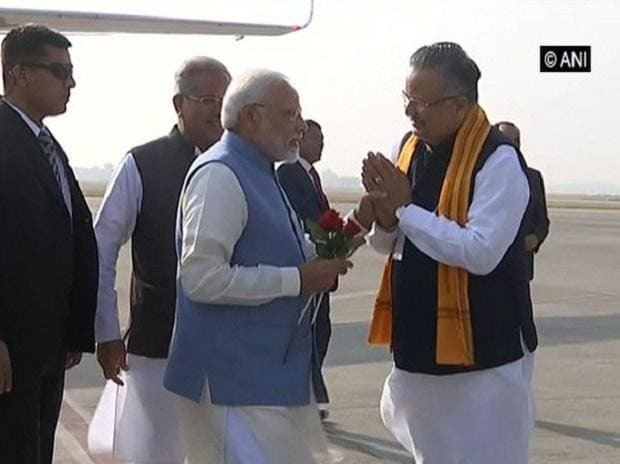 Prime Minister Narendra Modi was welcomed by Chhattisgarh Chief Minister Bhupesh Baghel and state BJP leaders at the Raipur airport after he made a brief stopover en route to Odisha. The prime minister arrived at the Swami Vivekanand Airport here at around 8:40 am by a special aircraft and stayed for a couple of minutes before leaving for Balangir in neighbouring Odisha, a government public relation official here said. Baghel, former chief minister Raman Singh, senior BJP leaders and officials welcomed Modi at the airport, he said. The PM left for Balangir at around 8:45 am on board an Indian Air Force helicopter, he added. "It was a warm meeting with the PM. He congratulated me," Baghel told reporters later. It is the first time Baghel is meeting the PM since he led the Congress to a landslide victory in Chhattisgarh in the Assembly polls held in November. On the way back, PM Modi will arrive at the Raipur airport in the afternoon and after about a 5-minute break, he will leave for Thiruvananthapuram in Kerala, the official said.